The Summer 2018 season is officially here which means New Yorkers will be flocking to the East End to escape the city heat on the weekends. The restaurant scene in The Hamptons is similar to the city in that some stay season after season, some move to new locations, and others no longer make the cut of the discerning crowds. We have gathered up some of the best places to eat in the East End from classics to new spots, from Southampton to Montauk. Maison Vivienne is the newest opening in Southampton that is serving up French Provence cuisine by Michelin Star Chef Wolfgana Ban. The venue is comprised of indoor and outdoor seating, herb and vegetable gardens, a bar and lounge, and a small Inn that is comprised of 9 rooms with 2 suites. The Inn, situated in a 17th century Dutch Colonial building offers all the modern amenities guests would expect including access to room service from the restaurant. Chef Ban is serving up fare that is a modern take on classic southern French cuisine included cote de bouef and roasted heritage chicken for two as well as a salad nicoise. The inside is not go unnoticed with its 20-foot high cathedral ceilings and wine cellar which holds over 2,000 bottles. This Southampton restaurant (also located in TriBeCa in the city) is run by Gabby Karan, daughter of designer Donna Karan. She brings her chic décor to the interior and serves up southern Italian dishes including lamb loin carpaccio and rigatoni with sweet and hot sausage. The back patio, filled with umbrellas, is a great place to hang out and becomes a social hub in the summer. The restaurant has been drawing celebrity clientele season after season. The city favorite is also a favorite on the East End offering both indoor and outdooring seating in the heart of Southampton. Sant Ambroeus serves northern Italian cuisine thanks to its Milanese roots. In addition to lunch and dinner, it is a great spot to grab a proper coffee and conversation. The popular East Hampton scene, which lost its space to EMP Summer House last season, has found a new space to call home. The partners have signed a 2-year lease at the East Hampton Point space at 295 Three Mile Harbor Hog Creek Road. Diners can expect a menu similar to the old Moby’s which served everything from brick oven pizzas to seafood dishes with a few additions. Given the new waterfront spot, we expect an elevated take on the cuisine. The new location is sure to offer great sunsets and views and will also allow guests to arrive via boat. Last year, the EMP crew took over the longstanding Moby’s space and created quite the buzz with its beachy pop-up. Reservations were only made available to American Express Platinum card holders and some card members even received access to the restaurants brand new BMW 7 series sedans. The EMP crew will be returning for a second year, serving up the likes of flatbreads, bouillabaisse, and family style dinners such as DIY Tacos or a Lobster Boil. The backyard with games such as corn hole and ping pong remains. This summertime only restaurant located on the water offers the perfect combination – good food and great views. Guests enjoyed the laid-back atmosphere with the deck being the perfect place to grab a cocktail. Beacon is famous for its fish dishes with this season’s menu including items such as halibut baked in parchment paper with sun dried tomatoes, lobster rigatoni, and oven roasted chicken. The Sag Harbor outpost of the Upper East Side gathering spot will be back for another season. The Sag Harbor location is larger than the one in the city you may be familiar with, but be warned that they run a strict door policy. The menu includes all the crowd favorites including the Cajun Chicken. We also recommend grabbing a drink at the bar to enjoy the scene. After splitting with Gabby Karan 2 years ago, Chef Maurizio Marfoglia kept the original space of Tutto Il Giorno in Sag Harbor and rebranded it as Doppo La Spiaggia which means “After the Beach.” His restaurant remains a go-to spot and still serves of favorites such as Chicken Under the Brick and homemade pastas including squid ink tagliotini. 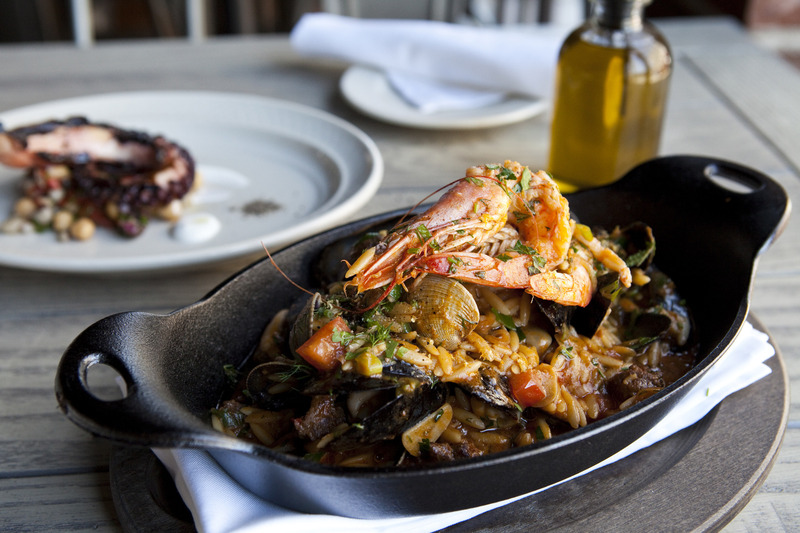 Menu items include a northern Italian influence such as the seafood stew as Marfoglia hails from Lake Como. Duryea’s Lobster Deck has been a Montauk staple for years, however, the restaurant received a facelift in 2016 when billionaire Marc Rowan took over. The waterside location affords it some of the most picturesque views and scenery in perhaps all of The Hamptons. Most dishes are served family-style including the full clambake, lobster cobb salad, and market fish. Of course, the Duryea’s lobster roll is a must try! Now that the warmer weather is right around the corner, you’ll notice that many more people are opting to dine at restaurants with outdoor seating. After all, there’s something nice about enjoying your meal outside, where you’re able to take in the views of the area around you while taking full advantage of the beautiful weather. If you’re in New York City or have ever visited the Big Apple, then you’re very familiar with the fact that NYC is an almost absurdly massive city. With approximately 304.6 million square-miles of this concrete jungle to explore, finding a place to settle down in for a simple meal can seem like a strenuous. Now, take the number of restaurants present in New York City and narrow it down to eating spots that have outside seating. The results will seem overwhelming to you, but rest assured: we have a few suggestions here. Here are the best restaurants with outdoor seating around New York City. Considering the fact that Industry Kitchen was named the winner of OpenTable’s 2016 Diners’ Choice, it comes as no surprise that this restaurant offers delectable dishes and stellar seating. Industry Kitchen provides diners with modern American cuisine that is based on seasonal ingredients. With stunning views of the Brooklyn Bridge and East River, there’s no way that you can have a bad seat at this restaurant. It’s widely accepted that it isn’t truly springtime until outdoor seating is available at this fabulous Italian restaurant located on the ground floor of Bowery Hotel. The outdoor seating at Gemma provide diners with views of the busy city scene, creating an atmosphere that is conducive of stylish downtown dining. This French shopping district is also a huge food hall, where visitors can come experience the authentic taste of Paris. Le District market sits right outside of many New York’s popular family-friendly activities that include across-the-way views of the Statue of Liberty and Ellis Island. According to Le District’s website, they are dedicated to delivering the best French cuisine with the best quality and service. One restaurant that can be spotted in Le District is Beaubourg, a ritzy French spot perfect for a meal with your family, friends, and coworkers. In warmer months, Beaubourg is a fantastic place to go to for lunch, as they offer terrace seating. The outdoor seating provides picturesque views of the Hudson River, making Beaubourg a wonderful eating destination for those who like their meals with a view. This Italian eatery serves up rich and flavorful cuisine and a dining experience truly unlike any other nearby. The garage-style doors, when opened, blur the lines between indoor and outdoor seating. Whenever you’re sitting in this restaurant, regardless of where you are, you will feel as if you are sitting directly outside, enjoying your food and the gorgeous weather. You probably weren’t expecting to find a burger chain on this list, but this isn’t just any Shake Shack. It’s the original Shake Shack, which is located inside Madison Square Park. This particular chain was first started in 2004 and was originally presented as a food cart. Today, you can still enjoy a burger and shake at the OG Shake Shack in Madison Square Park and take in the beauty of the park. There isn’t a culinary experience quite like a food cart, so if you’re around this one, definitely take the opportunity to try it out. This spot is the perfect place to hit up during the summer months, as its light and beachy atmosphere perfectly fits the gorgeous summer weather. With it’s hardy clam chowder, fresh poke, fish tacos and happy hour oysters, Seamore’s is fantastic for seafood lovers everywhere. The outdoor seating area suits the overall beach-themed vibe of the restaurant, as the colorful patio is embellished with striped beach umbrellas. If you’re ever in the mood for the robust flavors of Mexico, Rosie’s is the perfect fit for you. During the warmer months, tables are spread out from the restaurant’s garage-style doors onto Second Avenue. Rosie’s is a colorful and vibrant culinary experience with an impressive array of beloved Mexican dishes. This spot is a classic Italian restaurant that serves up lunch, dinner and weekend brunch. Join them for a wood-fired pizza, pasta, and other delicious Italian dishes. Located in Brooklyn Bridge Park, this upscale eatery only offers diners the best dining experience with quality Italian cuisine and service unlike any other restaurant in town. Cecconi’s Dumbo offers both indoor and outdoor seating; however, the place you’ll want to be enjoying your food is outside, as the restaurant provides waterfront views of the iconic Manhattan Skyline. Named “Best Outdoor Dining in NYC” by The Village Voice and the “Best Oyster Bar In NYC” by the New York Observer, Grand Banks is definitely the most ideal outdoor eating spot that you can visit in New York City. The seasonal oyster bar serves fresh seafood entrees and drinks aboard the historic wooden schooner, Sherman Zwicker. For more information on local cuisine in your potential new neighborhood, contact your local real estate agent today! If you have ever been to New York City, New York, you know that there is prestigious food at every corner. But for a price. The city that never sleeps is saturated with many people which means high demand, and ultimately, higher prices on food and things to do around the city. No need to worry. The food is incredible. New York City knows this and wants to allow people to be able to get the incredible savory food for a cheaper price. This is where New York City restaurant week comes in. Twice a year, the New York City restaurant week is held to allow people from all over to come and try delicious food for a fair price. However, there are many things to consider when attending the restaurant week. There are just about 400 restaurants that participate in the infamous restaurant week. Not every restaurant is able to participate though. In order to participate, NYC takes a few things into account. The chef’s background, the overall restaurant rating and reviews, and awards or other information. This makes it something that restaurants desire to become a part of. On top of that, the restaurant must offer a discount of 20 to 50 percent off the regular menu price to be picked. The menu will be chosen by the restaurant which is known as a prix fixe menu. It must include a three course meal and three choices for appetizers, three choices of entrees, and at least two dessert options. All participating restaurants will price their three-course prix fixe menus at $29 for lunch and $42 for dinner. You should be aware that not all restaurants will offer dinner and lunch at a special price. That’s why one should check ahead of schedule. You could also come across some restaurants with discounts on drinks as well. It is delightful to be able to have a choice of what kind of food you can have. You will also be able to find the NYC restaurant week dining guide in all participating restaurants a week before the event. Just keep in mind that beverages, gratuity, and taxes are not offered in the price. Restaurant week will take place from January 22, 2018 to February 9, 2018. During this time, you will find all the affordable, awesome meals. Just be sure to reserve your spot because all restaurants will most likely be very packed. Just in case one is looking to walk in, the discounts still apply. There is a little bit of a catch. The restaurants will not offer the discounts on Saturdays, and Sundays are completely optional. Restaurant week is packed and hectic. You want to be sure that you could have the best possible experience. Most would start with choosing the kinds of foods they would desire to eat. This will help you get closer to which restaurants to choose. If you already have a specific restaurant in mind, then you should set your sights on it. Once reservations open (January 8th) you should try to book that specific restaurant immediately. Try to keep your options realistic. It might be very stressful to get a restaurant that is very prestigious and just ruin the thought of it all together. When you make your reservation, try to confirm what exactly they will be serving so you have an idea. Most menus are available for viewing online in advance. Most restaurants are going to be very rewarding when you take in their savory flavors, but you might want the challenge of getting to taste the best of the best. There are lists that you can find all throughout the internet of which restaurants should be chosen. Maybe classic New York City restaurants are on your mind and your taste buds, or perhaps those ranked as the best experience, and taste. There are even lists for getting the options that only go for lunch. No matter what you choose, you are going to find some incredible meals. How about a dinner and a show? Luckily, this year, broadway week is going on during the same time as New York City Restaurant Week. This will create the ultimate dinner and a show date scene. Tickets will be two-for-one to the best Broadway shows you can think of! This combination of 380+ restaurants and 19 Broadway shows will have you and a partner hitting the city almost every day. Try out this guide to see some awesome combinations of food and Broadway shows. It’s all about the experience in the end. All-in-all, the Restaurant Week in New York City is an incredible time. You get to enjoy food from all over that most never thought they could afford. So, whether you live in New York City, or live far away, attending the experience of restaurant week should really be considered. Hopefully, you will have a wonderful time in the city that never sleeps. It is almost time to say goodbye to 2016 and hello to 2017. Everyone certainly has their preference when it comes to New Year's Eve activities, from staying home on the couch and watching the ball drop to popping champagne in clubs, we all welcome the new year in different ways. Deciding what to do for the celebratory occasion can be quite stressful, as there always seems to be pressure to do something amazing. Don't stress so much! If you are looking to get out of your apartment for a bit on New Year's Eve, we have selected a few happenings going on around the city. This, of course, is just the beginning as there are events are virtually every club, restaurant, and bar in NYC. These are just a few ideas of how you can ring in 2017 in NYC! Step back into time as you ring in the New Year at this year's prohibition party at Raine's Law Room. The luxurious evening will include and open bar and eats, live music, and entertainers. Era clothing is encouraged! The event begins at 9pm. Tickets start at $185. Looking for a more laid back option this New Year's Eve? Check out the fireworks display that will go off at Midnight in the park. The fireworks will be launched from the Naumburg Bandshell. The show should be visible from almost any vantage point in the park. Admission is free. The views from the 65th floor of Rockefeller Center are sure to be as pleasing as the unlimited Osetra Caviar. Enjoy a four-course dinner, open bar, and dancing from 8pm until 3am. Music will consist of a live orchestra until midnight and then transform into a disco. Tickets to this black-tie event are $1,500 per person. The Rainbow Room: 30 Rockefeller Plaza, 65th Floor. If you are looking for a nice New Year's Eve dinner, consider The NoMad. Restaurant chefs Daniel Humm and James Kent will be serving a four-course tasting menu. There will be two seatings available: an early seating (prior to 8:30pm) and a late seating (9pm and after). Pricing for the early seating is $165 per person will the late seating is priced at $225 per person. The posh midtown spot will be hosting a New Year's Eve party this is sure to impress. Boutique, frequented by the likes of Leonardo DiCaprio and Dylan McDermott will be having a premium open bar from 9pm-2am with music by Leekalt and Jen Stone. A champagne toast will be held at midnight. Tickets start at $99 for general admission. Going with a group of friends that have slightly different tastes? The Bowery Hotel New Year's Eve party may be the event for you as it will feature different "stations" throughout. The event, from 9:30pm- 2am, will include complimentary cocktails the duration, DJ performances, and light bites. Stations throughout include the Woodford Reserve Whiskey Bar, Herradura Mexican Hacienda Lounge, the Barrel Room (scotch), and Finlandia Vodka cocktails. Tickets start at $249. Does the summer season have you craving a delicious lobster roll, but you aren't sure where to look? With each bite, the quintessentially New England summer staple has become a means to escape from the hot and steamy city to the calm and serene water's edge of Maine. The delectable sandwich is now quite popular outside of New England, with many places in the city and The Hamptons vying for the "Best Lobster Roll" title. The Victoria Shtainer Team has curated a list of spots both in New York and The Hamptons that often top the lists of best lobsters. In no particular order, we present you some of our favorites. We would love to hear- what is your favorite spot to grab a lobster roll? Share with us in the comments below! Luke Holden, Maine native and former investment banker, started his business in 2009 with the first outpost of Luke's Lobster in the East Village. They now have a presence in 8 states. Mr. Holden controls every aspect of the supply chain, resulting in fresh seafood that is sustainably sourced. The roll is made with knuckle and claw meat only, taking 3.2 lobsters per roll. Meat is mixed with a little mayo, proprietary seasoning with hints of celery and oregano, and lemon butter on a classic, New England-style roll. Pearl Oyster Bar opened in 1997 with Rebecca Charles making the first Manhattan lobster roll here, rendering her eatery one of the first places to really be inspired by New England summers and fresh seafood in the city. The roll is simple, consisting of lobster salad with mayonnaise, lemon juice, and chive atop a grilled bun with butter..
On Pier 25, situated on the historic schooner, Sherman Zwicker, Grand Banks offers a setting that feels as if you are transported away from the city. The floating vessel is the perfect spot to enjoy the summer indulgence of lobster roll. "New Bay" spiced chips is worth noting as well. This is one our team's favorite spots! The Mermaid Inn is also a long standing veteran in offering up great seafood. Many flock here for oysters, but Mermaid Inn serves up a great lobster roll as well. Another simple rendition, their version consists of a New England-style bun with lots of lobster and mayo. (We have heard rumors that they were serving it on a brioche bun at one point). The side of Old Bay fries is also a crowd pleaser. Located in Sag Harbor's Long Wharf, Dock House is reminiscent of an old fisherman's shack, but do not let the exterior fool you. The restaurant offers up award-winning dishes and chowders as well as a great lobster roll. Their approach to the roll is one of simplicity, served on a toasted bun with the fresh lobster meat standing out. With the picturesque setting on Sag Harbor, what's not to love about lobster roll and views of beautiful yachts? Started by two local schoolteachers as a summer project, the shop is a great go-to for grab-n-go rolls to take to the beach with its Wainscott location. The roll is served up on a hot dog bun with celery, red onion, and hints of garlic. While you are picking up your lobster rolls, you can grab other meats and produce for an evening grill out, all in one place. Would the list be complete without the restaurant that is named after the dish itself? Started 49 years ago, the highly instagrammed outpost will ask if you want your salad served hot or cold. Lunch is often credited with creating the cold lobster salad as we know it today. The cold roll is a mayonnaise-based salad with celery on a toasted, buttered bun. The hot roll, on the other hand, consists of steamed, whole pieces of lobster served on the side of a toasted bun. Both variations come with a side of fries. The relaxed and casual atmosphere make for an easy seaside afternoon. Clam Bar is located on the Napeague stretch of the highway, on the way to Montauk. They receive their seafood fresh each morning, delivered from local fishermen. The Clam Bar takes a "sometimes simple is better" approach to their roll. It is crafted from three ingredients: claw & knuckle meat, celery, and Hellmann's mayo on a toasted bun. What better way to spend the summer than with some sun and a good lobster roll. Imagine lounging by the pool at our listing at 1155 Noypac Path with your lobster roll in hand! Please contact us if you are interested in viewing the property. 1155 Noyac Path, Water Mill. Currently offered at $4,995,000. Father's Day is just around the corner on Sunday, June 19th so its time to start thinking about planning a special day for him, or, perhaps, a special gift. Father's Day does not have to mean another tie to add to his collection of hundreds. The Victoria Shtainer Team has curated a list of places to take Dad on his special day in the city and The Hamptons from a little R&R to some great brews, we have the perfect list for you. If you are unable to spend time in-person with Dad, consider sending him a thoughtful gift. Below, you will find a selection of gift ideas that will be sure to add a luxurious touch to his day. Kayaking on the Hudson : Spend some time on the water of New York Harbor, taking in city views from a different perspective. The Downtown Boathouse is an all-volunteer nonprofit organization dedicated to providing free public access to the harbor in NYC. With that being said, sit-on-top kayaks as well as brief instructions and all necessary safety equipment is provided complimentary. John Allan's Spa for Men : This spa, or as dubbed by John Allan, "men's club", is all about just that, men. It is the premier men's grooming club that has created a luxury concept and lifestyle around their brand. Multiple locations can be found throughout the city, and they are available for yearly membership or on a per service basis. Consider treating Dad to the signature Full Service which consists of a 30-minute grooming service with scalp massaging shampoo and conditioning treatment, hot towel, haircut, manicure, and shoe shine. Looking for a rejuvenating rubdown? Choose from Swedish or deep-tissue options in 30 or 60-minute sessions. The NoMad: The restaurant at the popular NoMad hotel is a sibling to Eleven Madison Park and is a collaboration from co-owners Daniel Humm and Will Guidara. If you are looking to enjoy a brunch with Dad with an elevated, luxurious atmosphere, this spot is worth checking out. The atrium dining room features inviting armchairs and the decor evokes a feeling of Old New York. Notable brunch items include the poached eggs and egg with quinoa. Afterwards, enjoy a cocktail in the library bar. Brooklyn Brewery: If Dad loves beer, consider taking him to Brooklyn Brewery to enjoy the tasting room and a tour. The tasting room is open on Sundays from 12-6pm, so you can come in and grab a ticket for a free tour. The Brewery has experienced a lot of growth, and as a result, their portfolio of brews has grown as well, with their Brooklyn Lager being the flagship. The free tours on Sunday start on the half hour beginning at 1pm until 4pm. Please note that tables in the tasting room are on a first come first served basis. Sadelles: Looking for a quaint breakfast with Dad complete with bagels? This is your spot! The SoHo eatery is known for its bagels and bakery specials that are all made in-house. The menu is all about New York Classics including bagels, chopped salads, and sandwiches. The signature menu item is the $100 tower of smoked fish and fixings for the ultimate Father's Day breakfast or brunch. If you are looking to enjoy dinner, the space transforms into a completely candlelit dining room in the evenings. Sparkling Pointe "Cheers for Dad": The Northfork vineyard will once again be hosting "Cheers for Dad" at the Tasting Room. Enjoy a glass of Sparkling Pointe sparkling wine paired with a trio of sliders. There will be live music by Alex Clough Jazz Duo. Tickets can be purchased online for $30. At Sea: A Designer Showcase: Get in the mood for summer with the new exhibition on display at The White Room On display will be artwork that pays homage to the summer season and the beauty of the East End. The exhibition features oil paintings by Jill Krutick, and photography by Michele Dragonetti, EJ Camp, and Claudia Ward. Pieces are available for purchase, so it is okay if Dad falls in love with one! Sangria Sunday's: Enjoy a relaxing evening at the Harbor Bistro in East Hampton with Dad. Sunday evenings, the Bistro hosts Sangria Sunday's with live music. You will enjoy $5 sangria, $6 drink specials, and $8 nosh specials including chipotle hummus, chicken potstickers, and grilled gulf shrimp. From a favorite cologne to luxurious headphones, below are a few ideas for gifts here is sure to love. You will not find any ties here! Browse some of our wonderful current offerings that are nearby our recommendations. The spring day filled with celebrations is almost upon us. Cinco de Mayo, the Fifth of May celebrates the Mexican victory over the French army in 1862. An unlikely defeat, the win was a huge boost to Mexican morale, becoming a symbol of unity and pride. The best way to celebrate is to grab your friends and some tequila at these hotspots around town. Dos Caminos: Dos Caminos is bringing back their "Cinco de Cinco" which is comprised of 5 days of specials (starting May 1) leading up to Cinco de Mayo. Specials that caught our eyes include $5 Coronas and $5 Churros y Chocolate. Check out all the specials here. Gansevoort Park: The trendy hotel will be hosting Cinco activities on their roof. Enjoy some great views in the sleek atmosphere on their rooftop. Specials for the celebration include $10 house margaritas, $6 drafts, and $13 tacos. Rosa Mexicano: Rosa has established itself as an upscale Mexican option with multiple locations in the city as well as elsewhere in the country. Rosa will be offering up a pre-fixe menu for $40. Selections vary by location, with menus being available here. We always recommend the pomegranate margarita! Anejo TriBeCa: The downtown restaurant and tequila bar is gearing up for their annual all-day Cinco de Mayo party. It is quite popular, and even Guest of a Guest is talking about it. The annual party goes from 11am until midnight with notable menu items including fried guacamole with tequila and mezcal specials. Blockheads: An easy go-to with various locations around the city having served up over 6,000 margaritas last Cinco! Specials for the celebration include $5 frozen and $8 shaken margaritas. Free chips and salsa included with any order...count us in!